You love a big bowl of chili. You love spicy Buffalo wings. You just can't decide what to have on game day. Don't distress! 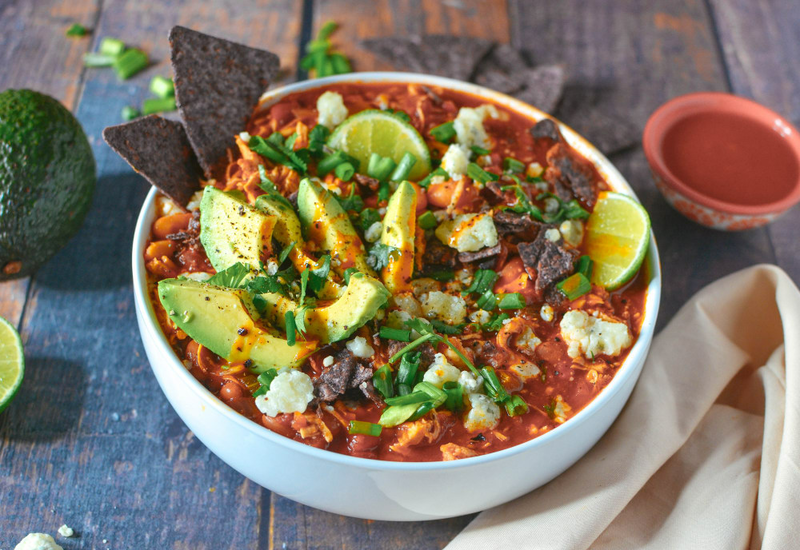 This recipe for Pressure Cooker Buffalo Chicken Chili incorporates everything you love about chili with the creamy and spicy flavor of Buffalo wings. The best part is, you can make the meal in a MultiPot in just about 45 minutes. When ready to serve, top the chili with your choice of extra wing sauce, crumbled blue cheese, grated Cheddar cheese, sliced green onions, lime wedges, or avocado slices. Sauté onion, celery, roasted red peppers, and garlic in hot oil until the onion and celery softens, about 4 minutes; season with paprika, chili powder, cumin, salt, and pepper. Stir crushed tomatoes, chicken, diced tomatoes with green chilies, wing sauce, pinto beans, and cannellini beans with the onion mixture. Once the cooking cycle has completed allow pressure to release naturally for X minutes, then set steam vent to Venting to quick-release remaining pressure. Remove chicken to a large bowl; shred into strands with two forks. Stir shredded chicken with the beans mixture in the pressure cooker. Ladle chili into bowls and garnish with desired toppings to serve. Cayenne pepper, hot sauce and melted butter are the base of the traditional Buffalo wing sauce. This can be prepared either mild, medium, or hot. This recipe uses a commercial prepared Buffalo-style sauce that can then be used an a wide variety of recipes. Pick a brand with a level of spiciness to suit your palate! Per Serving: 342 calories; 10g fat; 31.8g carbohydrates; 33g protein; 72mg cholesterol; 752mg sodium. This was so good that it's going in the "make and take camping" file. It's not an actual file, but still going in there. We do a lot of chili for camping because it's always a little cool by dinner time on this side of the mountains, even in the hottest of summer days. It's also the only time my boys will eat chili. May have to make a separate less-Buffalo batch for the younger palates, but the adults are going to CRUSH this with plenty of beer and cornbread. Good times ahead! I made this recipe for my parents and they loved it. It was loaded with flavor. I reduced the buffalo sauce by 1/4 cup since my parents don't like overly spicy foods, and it was perfect. I made this pressure cooker buffalo chicken chili and it was fantastic. I enjoyed more bowls than I could count. If you like buffalo sauce, then this is a must try. It's great for game day, weeknights, or just those cooler days where you want some delicious, hearty chili. It's the best of both worlds, what's not to love?! Addicting! Perfect for game day in front of the TV. It was a little spicy, but I added sour cream. I bet it also tastes great with ranch dressing. I am definitely making this again. Obsessed with this recipe! It was a little spicy, but had great flavor! I will definitely make this again. Love this chili! I altered it with a couple of habaneros and some frozen corn. Came out super delicious. Sprinkled some queso fresco on top. My new favorite chili. Chicken came out tough. The flavor was good though. This is a keeper. Spicy kick but not too spicy. This is my fiancé’s favorite. I loved the spice - it definitely warms you up on a cold day, and it’s the slow sneaky kind of heat. At first I thought I should have added more buffalo sauce but just wait for it. I think next time I make it I’ll try adding a little cream cheese to make it richer. I loved cooking the chicken breast whole and then shredding. It really kept it tender. I am new to IP and this was the first recipe I decided to make on my 6 quart Nova Plus. I am having the most difficult time trying to cook this recipe because I continue to get a “burn” error and the IP isn’t sealing. With a little research, it is very common for chili recipes and those with tomato based ingredients to burn easily at the bottom of the inner pot, therefore causing the burner to turn off. The solution is to NOT mix the ingredients together and rather layer them, so the starchier foods stay on top. I feel like this would have been a great tip to have in the instructions. I’m sure the dish is delicious but the directions could use a disclaimer or revision. 5 stars based on flavor! This recipe needs editing though. Adding the copious amount of spices directly on top of the sautéed veggies, and then smothering them with the chicken and canned goods caused a heavy layer of charred spices on the bottom of my pot. This caused a sensor error. Mealthy thought it had come to pressure when it had not. Adjust the recipe to add liquids at the bottom, and spices at the top! Despite the mishap, it was delish!